Standard room amenities : Cable tv, PPV movies, coffee maker, kitchen, hair dryer, electronic door locks, iron, mini bar, telephone with voise mail. Hotel amenities : Tours, safety deposit boxes, concierge service, laundry service, luggage, maid service. Excitement surrounds this desert oasis, which is adjacent to the Las Vegas Hilton, the Las Vegas Convention Center and minutes from the Las Vegas Strip. 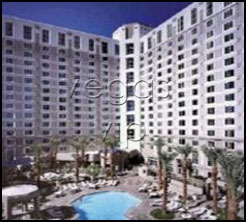 Convenient to the I-15 Freeway, it is easy access to nearby shopping which includes the Fashion Show Mall. 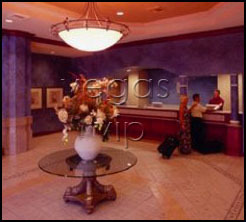 Hilton Grand Vacations Club at the Las Vegas Hilton is also located less than five miles from McCarran International Airport. Guests of this resort enjoy elegantly appointed studios and one & two-bedroom suites. 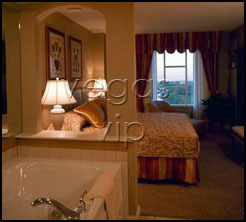 Views include the Las Vegas Country Club Golf Course and the Las Vegas Strip.